If you are looking for a smaller diesel coach to better navigate state parks and other tight spaces this is the coach for you. 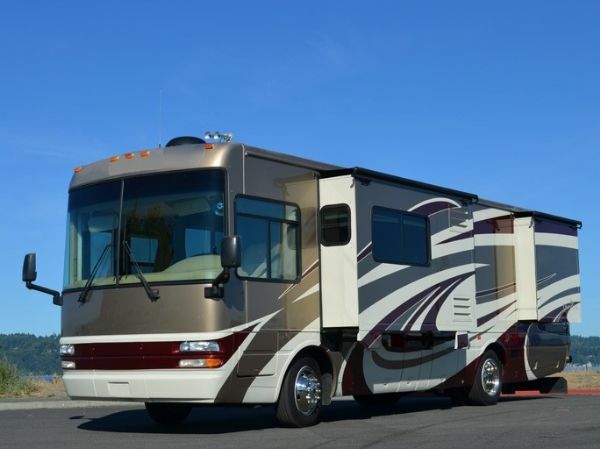 With only 7,200 miles this coach shows like new and at 33' it's easy to maneuver. While it is short in length the 2 large slide outs provide lots of room inside when you arrive at your destination. It is also loaded with all the features you would expect to find in a full featured diesel coach. The durable vinyl tile flooring stretches from the entry door all the way to the bathroom and provides a easy to maintain surface. The stunning full body paint scheme is in excelent condition with hardly a trace of blemishes or scratches. Don't let this one get away, smaller diesel coaches are very difficult to find!Back-up camera, 2 speed dash fans, cruise control, air horns, heated electric mirrors, hydraulic leveling system, sun visors, electric step well cover, privacy curtain, 6 way power pilot and copilot seats, passenger seat footrest, Flexsteel magic bed sofa sleeper, steel frame, laminated floor, fiberglass roof, padded vinyl ceiling, fiberglass compartment doors, passthrough basement storage with sliding trays, rear roof ladder, automotive undercoating, insulated tinted windows, power entry step, electric patio awning and window awnings, side slide out windows, awning toppers, natural maple cabinets, vinyl tile flooring, Corian countertops and sink covers, stainless steel sinks, under bed storage, cedar lined closet, porcelain toilet, water heater bypass, one piece fiberglass shower with glass enclosure, 50 AMP power cord, 2000 watt inverter.Constructed on a Freightliner chassis and features a powerful 300-HP CAT engine, in this size of coach it feels more lake a 400-HP in a 40' coach! The engine is mated to a reliable Allison 6-speed automatic trnsmission. The 8.0KW Onan diesel generator will provide all the power you need whan shore power is not available.